Instructions: Prepare a white card base 5 x 7" and layer a piece of blue cardstock on top 1/8" smaller all the way around, add foam sheet to the back and adhere to the card. 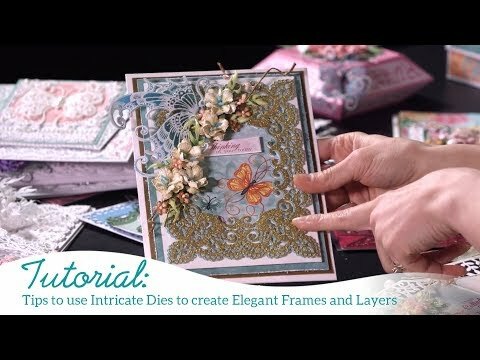 Cut the white frame out using the Intricate Swirl die, add foam to the back and adhere to card. Cut another piece of the blue cardstock out to fit within the frame, add foam sheet to the back and adhere to card. Cut 2 of the corner dies out of white cardstock and place in 2 of the corners. Stamp the sentiment in the center of the card with the Emerald Ink. Stamp the flowers on white cardstock with the Forget-Me-Not ink, color the center with the Buttercup, cut out with the matching die, shade the edges with the Paradise Teal, use the Flower Shaping kit and shape the flowers. Add buttons to the center of each flower and adhere to card. Stamp the leaves on white cardstock with the Olive ink, color in with the Leaf Green, cut out with the matching die, shade the edges with the Emerald ink, shape and cut apart. Add on top of the 2 corners as shown under the flowers.